A smooth gold ring interlocked with a silver ring adorned with small clear crystals, hugs a large 12-13mm AA grade white freshwater pearl. 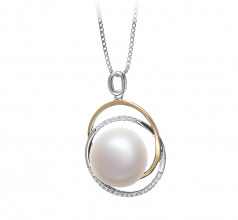 Aesthetically pleasing to the senses, this pendant has a timeless beauty that will never go out of style. It’s a perfect gift for your daughter, your grandmother, and all the other important women in your life. Soft rounded curves showcase the perfection of the pearl, bringing to focus its iridescent rainbow hues that playfully glide across the smooth surface. No matter what you pair it with, the Judith pendant is a great match for any color or style you wear. 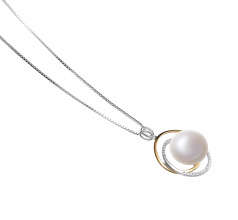 You can’t go wrong with the bold and classic lines of the Judith pendant. 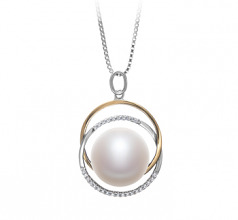 It’s sure to become a treasured heirloom piece. Show only for "Judith Pendant"